I come from the West Riding of Yorkshire, an area known for its woollen mills and textile industry. In school holidays I used to cycle to a mill known as Washpit Mills, situated near the top of our valley. At this time a few remaining mills in the West Riding still had steam engines for power and Washpit Mills was one such mill. Known as ‘AGNES’ this engine had been built in 1909 and, in the early 1980s, was still used to power the whole mill. When I started visiting the mill the engineman – a chap by the name of Herbert White – initially involved me in simple tasks in looking after the engine and gradually let me take on more and more as time went on. The engine was large and powerful, for example the flywheel on its own weighed 28 tons, and being about 14-16 at the time the whole experience left a lasting impression. I realise now that I was incredibly lucky – unbeknown to me at the time I was witnessing the absolute end of an era. One of the things that influenced me was the engineering involved and in particular how the Victorians obviously placed great importance on the ‘look’ of the technology, in other words the aethetics of the engineering. The mill is still in use today. 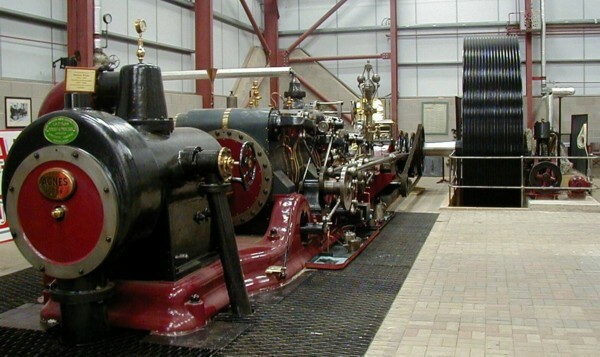 However the engine is no longer there but has luckily been restored and can be seen running at Markham Grange Steam Museum. The mill itself is used for weaving fine wool for expensive carpets and is owned and operated by a German company. Last time I was there (January 2008) they were installing a new multi-million pound machine – made in Germany. I guess Thatcher is largely to thank for it not being owned by a British company installing British made machines!